This might just be the easiest DIY we will ever post! This is a very quick (under five minutes) craft that ANYONE can do and it requires nothing more than some fabric and a pair of pinking shears. As some of you may already have seen, Humphrey turned one last week and we had a little birthday bash to celebrate. No party is complete without a celebratory outfit! This super simple DIY is an easy way to create a little something special with next to no effort and cost. You can buy the fabric, use a remnant, or recycle and give new purpose to some past-best material from around your house such as an old dress shirt, linen, or a tablecloth. 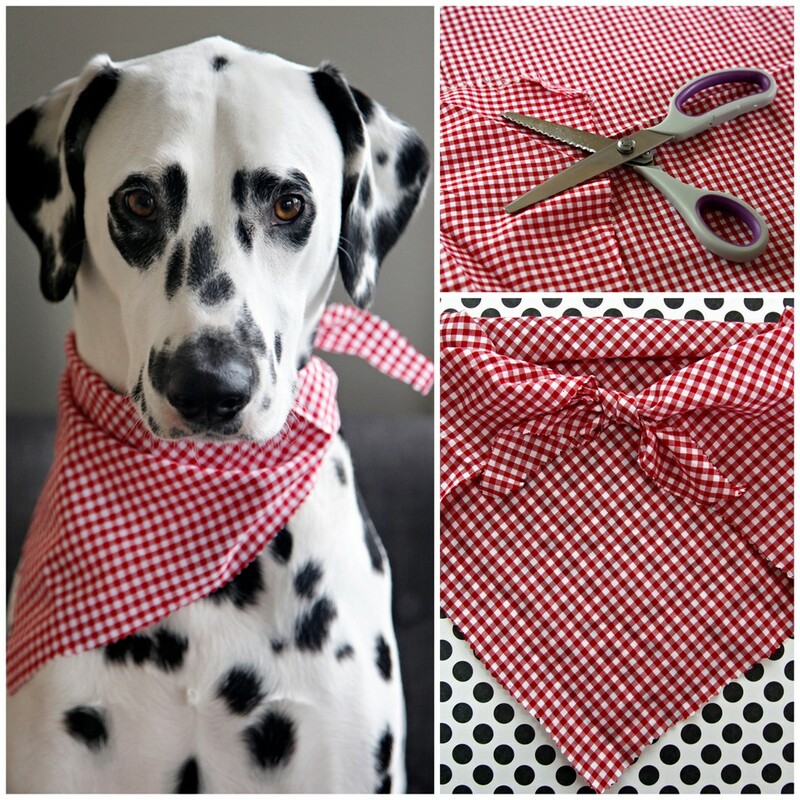 Cut a square such that the diagonal corner-to-corner fold (forming a triangle) is big enough to fit loosely around you pet's neck plus extra to tie a small knot. If you aren't comfortable with guesstimating the size, you can use a collar as a gauge or loosely measure your pet's neck. Don't forget to add a little extra to the neck size for tying the knot. Pinking shears help to reduce fraying without the need to sew the edges. Simply cut and you're done! Easy! Hi there! We didn't create/post a pattern for this particular DIY, but not to worry - it's so easy it probably isn't worth your effort to print one anyway. :) This now-sew bandana is simply a right triangle (e.g. half a square on a diagonal) so that the long edge (the diagonal cut) is long enough to fit loosely around you pet's neck plus a little extra length so that you'll be able to tie a small knot. Since the edges are pinked not sewn, there are no seam allowances to worry about. Hope that helps! How long will it last before it frays? Can I wash it? Oh, that's a tricky question as it depends on the fabric - some will fray very quickly and others hold up very well. Pinking reduces fraying, but it doesn't stop it all together. It depends on the weave and stability of the material you use, the orientation of the cuts, and how much wear-and-tear the bandana gets over time. Humphrey and Oli still have these red and white bandanas. They don't wear them routinely (bandanas are special dress-up and occasions only around here) but they have been worn and washed several times. 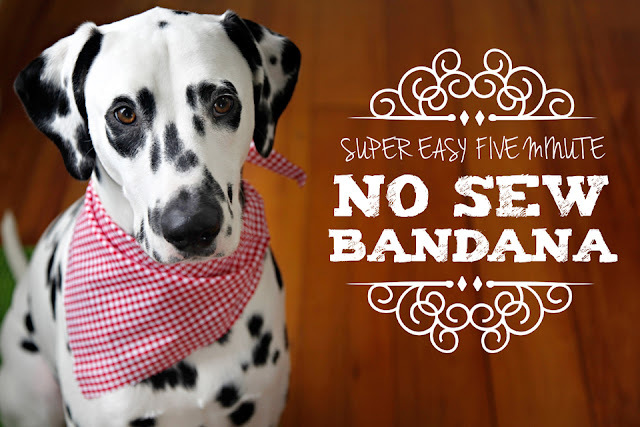 If you want a truly durable bandana, I'd recommend going with a sewn style instead. We have several DIY examples here on the blog, and most are pretty easy to sew with basic machine-sewing skills. Alternatively, if you want a really easy-sew option, you can also sew a single line of stitching just in from the pinked edge of your fabric, which will help limit fraying to the seam line. I'd suggest using the fold-over square for this style of bandana.